Okay, so since we’re talking about taking risks and going on adventures this week, I thought I’d give you an inspirational little treat. I’ve been hanging onto it for this exact moment. A bunch of weeks ago, I finally had the chance to hear Bob Goff speak live and in person. I usually only get to stalk him on the internet, so this was an exciting day. He made a super cute video for my small group. And he said some things that have been rattling around in my head ever since. The edge of yikes. I just loved that. If you’re not familiar with Bob, you should be. Especially if you’re contemplating a big life change any time soon. I could probably narrate the last eighteen months of my life entirely in Bob Goff quotes. That’s how much his words have influenced me. So as I spend this week telling you about this new season of our lives, I’ve got to point you to Bob, whose words have helped inspire us and give us courage and remind us that this life should be filled with joy, and adventure, and even a little bit of mischief. And just because I love it so much, here’s a little excerpt from Bob’s book, Love Does. So the next time God asks you to do something that is completely inexplicable, something you’re sure is a prank because it requires a decision or courage that’s way over your pay grade, something that might even save lives, say yes. Yesterday, I told you what saying “yes” and living on “the edge of yikes” looks like for me right now. What’s it look like for you? Elle! My virtual friend! I love that you are sharing your journey. The hubs and I recently took a leap of faith, following what God told us to do. It was certainly a ‘yikes’ moment in our life – I’m kind of hoping it was one of many though. On paper it seemed crazy, and it wasn’t even like everything lined up perfectly in time, but now we sit back and see just how far God has brought us and how amazingly blessed we are, we wouldn’t change it for the world. Reading your thoughts has also helped me understand my husband – he’s the cautious one, I’m the risk taker. 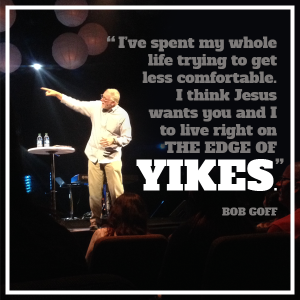 Congrats on hearing Bob Goff – I’m jealous! Congrats on the new gig – Orange is amazing! Congrats on taking the risk – it will certainly be worth it! I’m excited to continue to hear about your journey!!! Carson! You are so great. Someday we’ll become real-life friends, I just know it. 😉 That is so awesome, I love hearing stories like that. So excited for you guys. I love watching the cool things you’re up to from afar. And thank you for for encouraging and being excited for us, it means a ton! Love this post, great stuff! !